Those in Dundee and Angus may be interested in this. A van is leaving Carnoustie next Wednesday (9th) heading for the refugee camp in Calais. SHELTER – Sleeping bags, tents, blankets, pallets, canvas sheets, tarps. CLOTHING – Belts, rucksacks, bags, shoes, socks, underwear, hoodies, waterproofs, jackets, hats, scarfs, gloves, bags, towles, trousers, jeans, t-shirts, jumpers, babys and childrens clothes. HYGIENE – Toilet bags, toothbrush, toothpaste, soap, tissues, sanitary products, tissues, toilet roll, mouthwash, razors, shaving foam, brushes, combs, bobbles, shower gel, shampoo and conditioner, deodrant, wet wipes. FOOD – Tinned food, rice, pasta, oil, sauces, sugar, flour, packet food, longlife milk, tea, coffee, juice, water, baby milk and food. ADDITIONAL – Candles, torches batteries, pots, pans, lighters, cups, baby bottles, anything which will help. Marianne Scott (who I don’t personally know) is organising this and doing the drive. She’s unemployed and using her savings for the petrol and ferry ticket, so financial donations also help. There’s a bank account set up, but probably safest to get details from her rather than for me to post it here. We are perhaps seduced into believing that the UK is moving into the Harry Potter economy, in which so-called ‘creative’ industries, such as film production, television and publishing drive wealth creation and employment. Indeed, some years ago it was suggested that boy bands contributed more to the GDP than the aerospace sector. While I’ve never been able to fully examine the veracity of this claim, the day after One Direction called it a day, I paid a visit to the Tayside firm of Scott & Fyfe. The broad product portfolio of this textiles manufacturer includes composites that stitch bond together glass, carbon, aramid and other high performance fibres in products that are used in a range of sectors, including aerospace. While this company’s turnover may not quite be up there with the world’s top grossing music act, they represent a sector that is vital to the UK economy. The textiles industry in Scotland has undergone something of a renaissance in recent years, contributing over £1 billion to the economy, and generating considerable export earnings. There are currently around 570 companies Scottish textiles manufacturers directly employing around 9,000 people. In Scotland we still make things. But we make them, and create them very differently, and Scott & Fyfe shows us a unique way of doing things. The company has a 150 year history as a manufacturer of technical textiles, from its base in the small coastal town of Tayport in the north east corner of Fife. What it weaves and knits are the textiles that are used to create motorcycle helmets, rubber underlay backing, irrigation piping systems, bus interiors, yacht hulls, water slides, truck wind deflectors and much else. This company, which has a global reach in highly competitive markets, is a hidden gem of Scottish innovation. For me, its significance and inspiration comes from its unique fusion of design and democracy that creates an aspirational, highly creative firm that values and fully uses the skills and insights of its employees. The global economic crash of the late 2000’s coincided with a crisis in the company’s fortunes. But its slide towards crisis was caused less by recession and more by its long-term failure to innovate and develop new products. “Ours is a business of failure”, said Michaela Millar, the hugely impressive Business Development Officer who had invited me to the company. 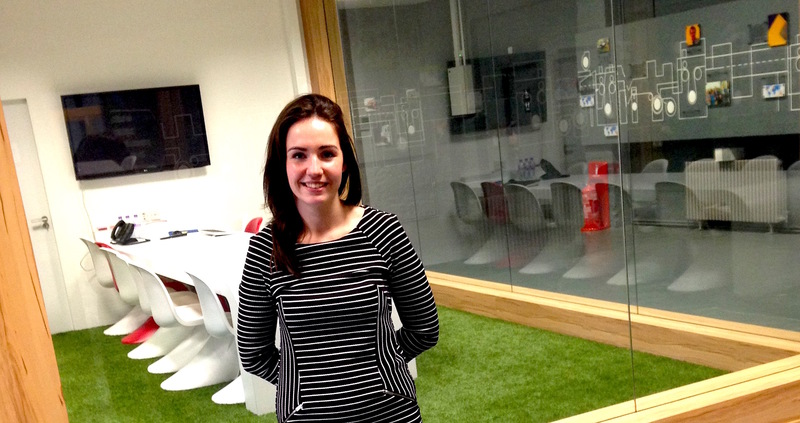 Michaela’s background is in textiles design from DJCAD, but it is evident that her responsibilities go far beyond a design brief. She explained to me that the company’s varied markets demanded constant innovation and bringing new products to the market. Most of these products will fail, so the task is to learn from failure, build on success and move on. In our risk averse culture, this attitude is refreshing and places Scott & Fyfe in a rare group of organisations which have succeeded in finding strategies that innovate through encouraging creativity. 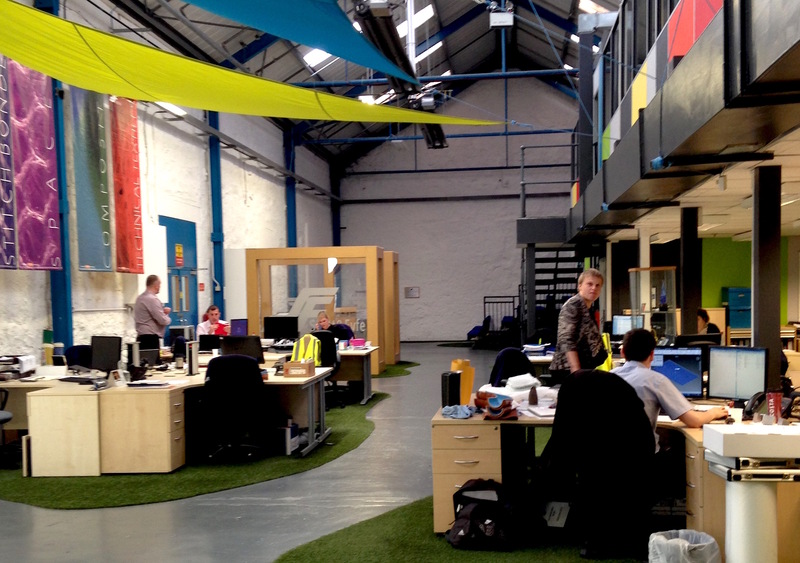 Talking to me in one of the innovation pods in a huge open area adjoining the factory, painted in primary colours and floored in astroturf, Michaela told me how two key developments pulled this ailing family-run firm back from the brink. In 2010 the company began to work with Glasgow School of Art’s Design Innovation Studio, to explore how creative thinking and innovation could infuse its culture and operations. This resulted in a range of tools and methods being explored and applied in the company. This opened them up to new perspectives and – crucially – new thinking tools that could be applied to new product development. Joined by Business Manager, Michelle Quadrelli, the two spoke to me with obvious passion and enthusiasm how this design-led strategy was quickly accompanied by a move towards employee ownership. In December 2012 Scott & Fyfe evolved from a fourth generation family owned firm to a fully employee owned enterprise. The workforce is fully informed and briefed on what the firm is doing, and above all is valued in terms of their knowledge and skills. The tools provided by GSA are one means of harnessing this vital expertise, and turning it into new successful products. This appears to be a vital element in the company’s success – and all too rare in the UK. Unlike Germany and the Scandinavian countries, industrial democracy has been notably absent from Britain’s industrial landscape. Perhaps predictably, it is on the agenda of none of our political parties, and it should be. Scott & Fyffe shows another way ahead for our manufacturers – based on design and democracy. It embraces creativity – the creativity of ALL of its workforce. 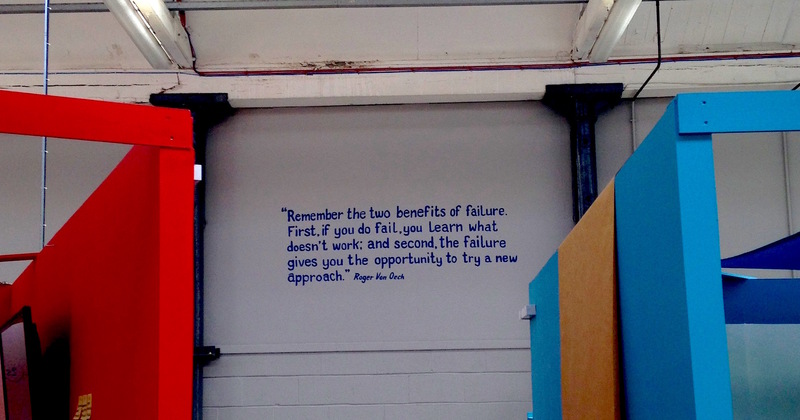 Far from pillorying failure, which is seemingly our national pastime, it uses failure as a useful source of learning. As Michaela said to me “we fail fast, and we fail often, and that way we do things better.” It uses methods of innovation and design thinking that I last saw being applied in California’s Silicon Valley. It trusts and it values its people. And yes, they are “people” not “human resources”. Giving relatively untested employees like Michaela trust and responsibility is refreshing. Hers has been a steep learning curve, but the scope to explore new markets and possibilities has brought the very best out of this highly talented young woman. But that is my enduring impression of Scott & Fyfe – an enterprise that knows that its employees are its most valuable asset. Respect and value them, give them a stake in success, support them and give them tools and space to creative, design and take risks – and you will succeed. With design and democracy, Scotland’s enterprise can be world class. The event we held in Dundee on 24 June to promote a pop up retail culture in the city was a great success, attracting a large and committed audience who listened to some great speakers and participated in four diverse workshops. We have put together this Storify on the event which captures its atmosphere, and details some of the key points made by speakers. So what is the outcome of this event? First, people are invited to put themselves on a register of interest. Simply download and return this enquiry_form. If you are proposing a food and/or drink pop up then additionally download and return the PopUpDundee_EnvironmentalHealthForms. Second, a number of pop up market opportunities are being provided. These include a two day pop up market on November 20 and 21. Prior to this event there will be smaller events to help test and refine the concept and the offer to shoppers. Those on the register of interest will be contacted to advise them of the opportunities. Third, the City Council is working with property companies and developers to help open up access to suitable buildings and other spaces in the city. 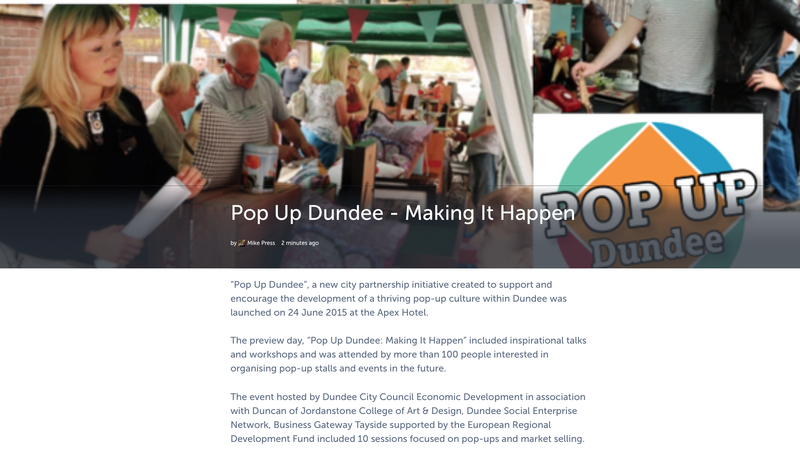 Pop Up Dundee never has been about “the council” making pop ups happen. The City Council certainly can play a catalytic role in opening up opportunities, bringing people together and encouraging enterprise, but ultimately this is about providing space for creative enterprise to flourish and lead a renewal of the city. City Centres are in trouble – and not just ‘post-industrial’ cities. Recent visits to affluent cities in the south east of England reveal the exact same problems that we face in Dundee – vacant shops, growing urban decay and a general tiredness and lack of vitality. Put simply, the economic model that in the past sustained urban centres no longer works. We shop differently, and expect different things of our city centres. We need to reinvent them. Pop up enterprises have proven their worth as low cost ways of testing new business ideas and encouraging entrepreneurship. They add hugely to the life and vibrancy of towns and cities, and explore creative new ways of using spaces and places. How about throwing in a local currency? 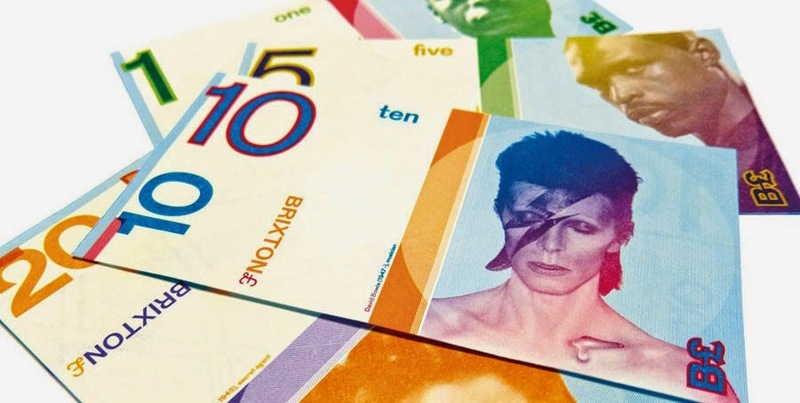 Brixton and Bristol are among those places that have their own currency. Research suggests that use of a local currency raises cash flow within the independent business sector and boosts local employment. Not only does this contribute to a more sustainable local economy, but it provides strong social bonds within communities. Now is the time for bold creative ideas and above all actions that can make new things happen in our city. If you want to help make change happen in Dundee, then get in touch. Meanwhile, here’s some useful information! Be a New Designers social media ninja! 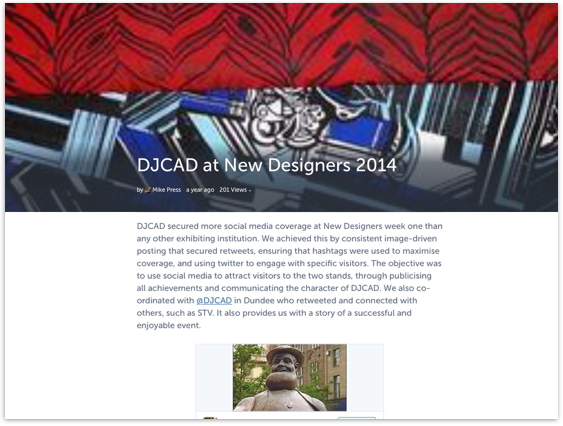 In 2014 the week one Dundee (DJCAD) crew had more social media coverage than the rest of New Designers put together! Don’t believe me? Well check out this Storify from last year’s coverage. And what did that achieve? It contributed to a record increase in conventional media coverage, greatly increased visitor numbers to the stands, increased the opportunities for job offers, internships and exhibitions, and overall raised the attention and profile of all of our students. 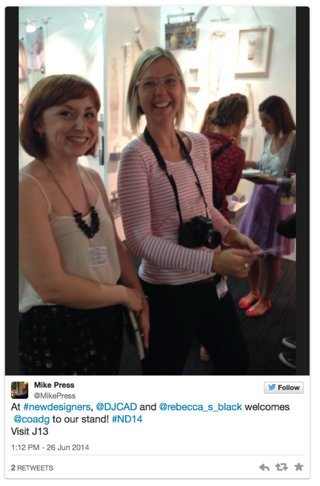 Social media is not an optional add-on at an event like New Designers. It is totally essential. And it has to be considered strategically. Our graduates worked as a team to maximise coverage and to co-ordinate their efforts. Right from the start of their courses at DJCAD, we make sure that our students are effective and professional users of social media. All students from every institution should make use of social media at New Designers to maximise the opportunities of the event. It isn’t rocket science, it’s actually quite straight forward. But from our experience in 2014, nobody else was doing this strategically. So, this is what you do. Just make sure that you do it. Step One. Work on your profiles for twitter and linkedin especially. 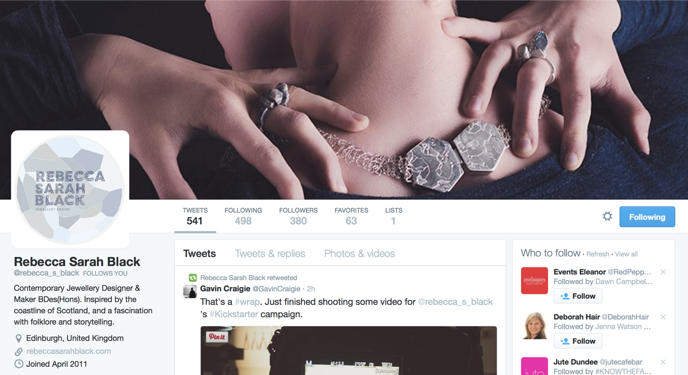 This is the profile for Rebecca Black, who in 2015 is in the One Year On show. She was our perfect Social Media Ninja! Rebecca realised that the profile you use is vital! Take out any reference to you being a student, and especially reference to your age. You are not a student. 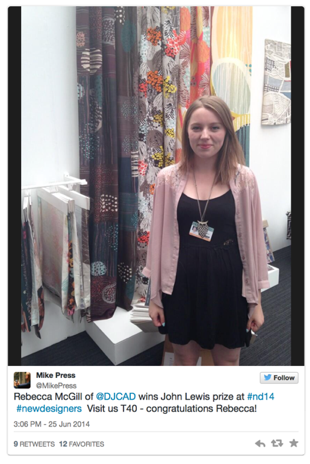 At New Designers you are a professional. Ensure that your social media profiles express this. Consider carefully how you will describe yourself and brand yourself. Ensure that you social media profiles have links to any website. Use your best quality images in these profiles. Beth Spowart was another of our stars from last year, presenting a professional, expertly designed and informative profile for her twitter page. These things really matter. In fact they are vital if we want to be treated seriously and professionally. This has to be all in place before the next step. Between now and the opening of the show follow everyone you can who is relevant to your aspirations. This is on the assumption that 30% of the people you follow will follow you back. So look at who people just a few years down the line in your field are following. If you’re not following people like @TheDesignTrust or @coadg then you clearly are not serious about your future! Find out who they follow. 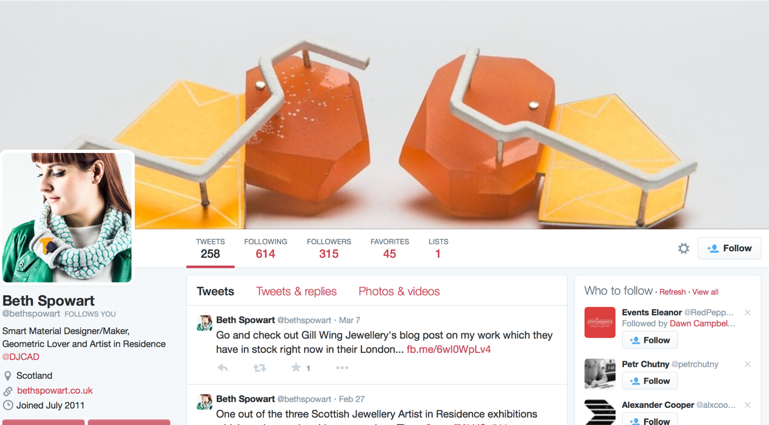 Ideally you want to follow people who are likely to visit New Designers, because that’s the trick here! Put yourself in the shoes of a busy retail buyer, gallery owner, or design manager who has 90 minutes scheduled in their diary to DO New Designers. As they walk up Upper Street, they check the twitter feed on their feed. What’s trending on #ND15? Last year it was Dundee. So they made a point of seeing us. You need to do some detective work on figuring out who to follow. But in an hour you could usefully double your followers IF you focus on key leaders in your field and trust your instinct. What tweets do you really notice and read? The ones with images. If I want to be noticed then I’ll use an image to ensure that my reader lingers on my tweet in their feed. Load your phone with at least 10 (or 20) of your most compelling photos of your work. You can use these to drive your twitter posts in the first day or so. But bear in mind that most twitter readers on phones show an image that is 1 high by 2 wide. It crops whatever you post. Use this to your advantage. Think killer images! And put text into them. If you don’t have space in the tweet to put the stand number or other details then simply put this into the image. If you don’t know how to do this then I’m not sure you should really be at New Designers. Then ensure that in every tweet you use the correct New Designers hashtag, you refer to your institution twitter handle ( in our case it’s @DJCAD ) because then they will retweet (assuming they get social media) and you use the stand number. Make sure you find out what the hashtag is for the event this year. I think it’s #ND15. If you don’t put the stand number, how will they find you? DJCAD Dundee students win more prizes at New Designers that those of any institution. We generally win a prize every year. Two last year. That is because our students are really very good indeed! 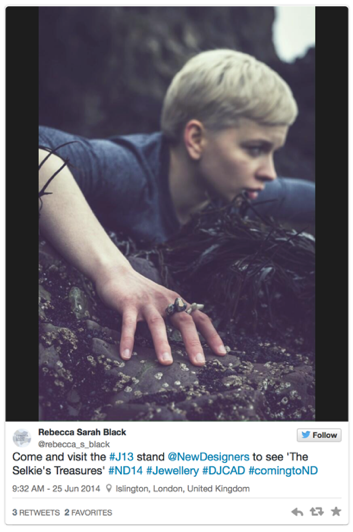 Above is Rebecca McGill from 2014 having just won the John Lewis prize. Now, when a person in your team wins a prize EVERYONE benefits, if you pitch it right. There is an immediate increase in footfall to see what amazing institution the student is from. But we can help lift this even further. Every time a person wins something, or gets a job or anything, tweet it! But always remember image, hashtag, institution twitter name, stand number. Last year within 35 minutes of me tweeting Rebecca McGill’s prize, the story was being run by STV back in Scotland. The more traction you get on twitter, the more it will be picked up at the event itself and rebroadcast. Following journalists back home, and asking them to follow you can really help here. If a prominent visitor polls up, take their photo, name check them and broadcast, as we did here when the UK’s most prominent design blogger visited us. If a TV crew turns up then do likewise. You want to broadcast and share all evidence that your stand is the best show in town and that you know how to tell a good story. But ALWAYS remember hashtag, institution twitter handle, stand number. Retweet what other people in your team is posting. You almost certainly have different followers, and in most cases modest numbers of followers, so you have to punch above your weight. You do this by working as a team and reposting or retweeting what your colleagues have posted. One person should be tasked with collating a Storify of the week. Apart from anything else it gives you a great account of the week that you can look back on. But if you update it every day you can see how the strategy is working, and what things are getting attention. New Designers is an amazing experience and a great platform for launching your career. But the chances you get from it are not down to luck. They are a consequence of your strategic approach. Have fun. Be strategic. Focus on your objectives. The Office for National Statistics published figures this week showing that Dundee has the fourth lowest employment rate in the UK with around 40% of local people not having a job last year. That’s the worst rate in Scotland, and in the UK only Liverpool, the London Borough of Newham and Middlesbrough perform worse. Something is very seriously not working in the city – and not just too many of its citizens. This is the City of Design, the first UK city to secure this enviable UNESCO status. This is the city that has a bold cultural future ahead of it, thanks to the V&A Dundee project, that promises a steady stream of visitors to its blockbuster exhibitions. Just yesterday the Business Editor of the city’s Courier newspaper wrote a challenging piece – Talent pool is huge – use it – that began with these words: “Last week I had the thoroughly depressing task of writing about yet another local company that has gone down the swanny…” It continued to describe the remarkable talents on display at the DJCAD degree show: “there was enough on show, from beautifully detailed animation works to silversmithing, graphic design to high-end fashion, to convince me the future of the city and the wider region is in good hands.” Graham Huband’s key message is that business needs to recognise and make use of the amazing creative talents of its design and art students. I agree. I’ve been saying this (in a variety of cities) for 25 years and, to be honest, only rarely do local businesses show any more than a passing interest in creative talent. Dundee holds its fourth economic summit next week. I am sure the so-called creative industries will be mentioned. They were at last year’s summit. And do you know what will happen? Nothing. Because design is not regarded as a core capability in a city’s economy. When design was referred to at last year’s summit we saw some photos of fashion and jewellery. I love fashion and jewellery as much as the next person – but that is only a very small part of what design is and what it can contribute. I am writing these words waiting for a plane at Amsterdam’s Schipol Airport. I am one of two design people going to Kuwait, along with a party from our School of Medicine to provide an innovative training and education programme for diabetes clinicians. Colleagues at Ninewells have been quick to see the benefits of service design in taking on some acute health challenges. And now health professionals in Kuwait want part of its benefits too. Increasingly design is seen as key to transforming healthcare in the UK and internationally. But we still have a job on our hands to persuade business to really embrace design. This is one of our key challenges. We need to demonstrate how design can make jobs, create opportunities, and transform the prospects for our citizens. 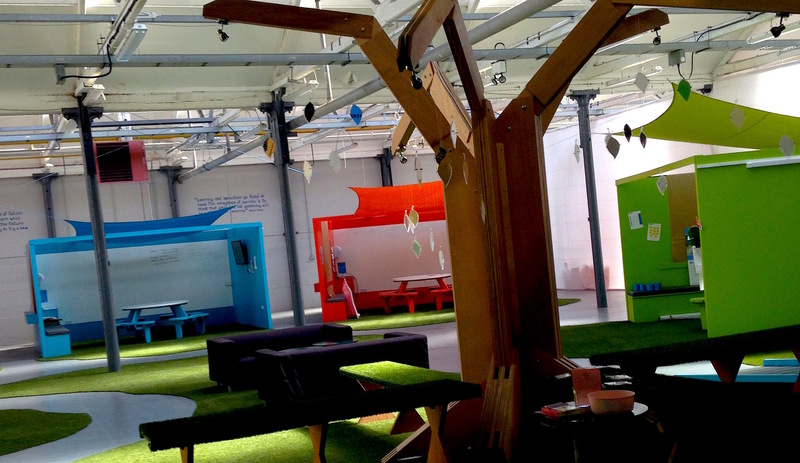 Design does not reside in ‘design schools’. It is not just something you see at degree shows. It is a way of looking at the world, of framing and solving problems, of thinking about new opportunities, and exploiting the creative potential of ALL the people – not just the arty ones! So what are the priorities? What do we need to do to design and make a better future for our city? Here is my six point design plan for Dundee. This is something that Catriona Macaulay and her colleagues at Scottish Government are active in doing, and we can expect some positive moves in this direction very soon. Imagine creating spaces where people can come together and prototype new services, create visualisations of how they want their neighbourhoods to be developed, move beyond talking shops and ‘committee culture’ and give people the tools to make their own future. Representative democracy has perhaps reached its limits and we should now create tools for participative democracy. 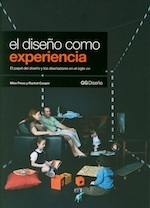 Throughout the world design has been used as a tool to develop policy in both local and national government. Design labs are one of the initiatives that is transforming how government bodies open themselves up to a broader range of influences, ideas and – most importantly – citizen actions. If you need evidence on the efficacy of this, then read the national research report Valuing Design, co-authored by Hazel White of the Dundee-based Open Change consultancy. I have made the case earlier that design is a vital tool to make us think differently about urban spaces and in particular to think about how we bring new life, culture and enterprise into our tired city centres. 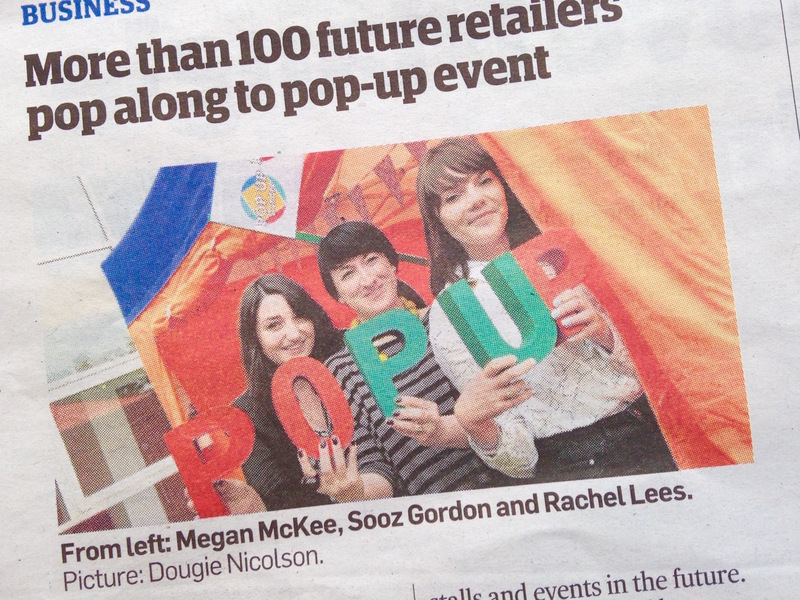 We need to design a pop-up revolution – not just in Dundee, but in all of our cities – to open up the boarded up stores for use by designers, makers, and enterprising would-be retailers, restauranteurs and others. As I wrote: “The City Council should work to strip back regulation, work with other bodies in the City Centre to identify and make available properties and locations, and invite the people of Dundee to literally reclaim their streets for vibrant enterprises and cultural activities.” And I’m very pleased to say that since those words were written just months ago, we have made considerable progress. Again, throughout the world there is a growing realisation that design is key to dealing with the acute health challenges facing us – design better and more effective health services, using technology more appropriately, understanding the needs of patients and communities. Dundee has some great examples of this already – but clearly we have much further to go. This is a city with some hugely challenging health outcomes, and so there is scope for great improvement. We need to be embedding designers in health teams and encouraging innovative initiatives that target the more acute problems. As the Dundee Partnership has argued before: “The current financial crisis and resulting joblessness and decrease in spending power across our communities will undoubtedly have a knock-on effect on people’s health and well being.” We can have all the innovation for health in the world, but unless the local economy picks up, it is unlikely to have much positive impact. We need to embed design within a local strategy for employment growth, that necessarily looks at how we support and sustain new enterprise development. As I have argued elsewhere, there is a policy gap in Scotland around self-employment and business startups, which we must address with some urgency. Self-employment and enterprise are not the enemies of a more inclusive, healthier community – they are absolutely fundamental to its development. We’re not short of ideas, creative talent, or enthusiasm. We could design and make a better Dundee. If the will is there. Designers and artists have a massive potential to breathe new life into our cities, to build new enterprises, and to offer people completely new products, services and experiences. In Dundee this is our vision, and this week an event will take place that will move us closer towards our goal of a vibrant creative city centre. 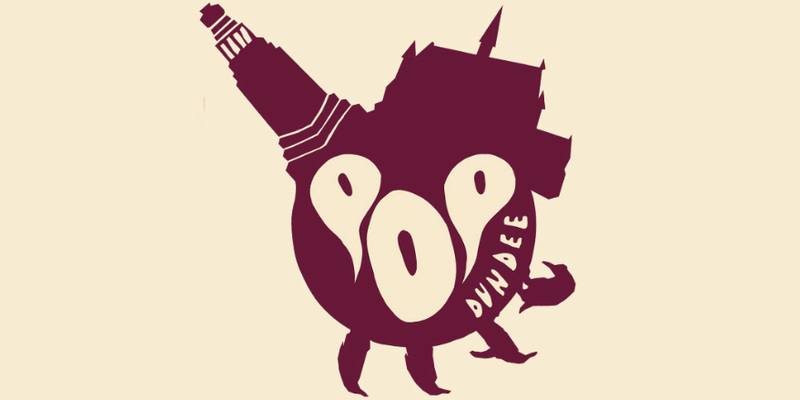 POPDUNDEE is a week-long pop-up shop that will be held in the Overgate shopping centre between 11 – 15 May. It is part of the 15 Good Deeds event run by the Overgate to celebrate its 15th birthday. During the week between 9am – 5pm, students from DJCAD will be showcasing and selling their work, ranging from art prints to jewellery to handcrafted gifts. This is a wonderful opportunity for emerging artists to showcase their talent and for the public to see what is being created right here in Dundee. POPDUNDEE also lays the ground for the DJCAD degree show, which opens on the 22nd May. Jamie Mowat, Ashling Larkin and Vicky Stephen are the three design students from our animation course who are organising and running the event. The initiative arose from their participation in the pioneering DJCAD design module Design Enterprise that aims to connect design enterprise with the city of Dundee. Jamie Shankland of Marble Boy Clothing helped to broker the connection between the DJCAD Design Enterprise team and the Overgate. POPDUNDEE is very much a product of Dundee’s status as UNESCO City of Design. Jamie, Ashland and Vicky attended Dundee’s first Pop Up Design Cafe organised by Creative Dundee back in January to celebrate this new status. POPDUNDEE shows how the City of Dundee is creating a powerful design vision, inspired by Creative Dundee, supported by creative enterprises, and made real by hugely talented and enterprising young designers. The forthcoming General Election demands us to be critical of all parties and interrogate their manifestos for the issues and policies that we believe to be most vital. There are three issues that I expect parties to address – creative education (in its broadest sense), the embedding of design methods in both policy making and the development of public services and the nurturing of the creative industries. I have a professional interest in all three of these. Creative education is not only fundamental to civilised values, but empowers citizens to contribute creatively to their communities and there is evidence that it enhances wellbeing. Indeed that was why Aneurin Bevan argued equally for the NHS and an arts policy in his ground breaking book In Place of Fear. Placing design within government and the public sector is demonstrably a good and progressive idea. You can pledge all the money you like to the NHS, but unless you address the issue of service design, then such pledges become meaningless. And creative industries exploit the talents of the UK’s filmmakers, craftmakers, designers, artists, writers and others to create wealth and employment. If these were the only issues that matter (and clearly they are not) then only Labour, the Liberal Democrats and the Green Party are in the running. The Labour manifesto refers to design nine times in the context of the redesign of public services and the introduction of co-design principles. To be honest here I was very surprised at this emphasis. Labour also assert “We will guarantee a universal entitlement to a creative education”. The Greens have a similar policy and further claim “We will set creative government free”. Their manifesto has considerable reference to design, including the design of safer cities and communities. So, some fine words and general principles, from both parties, but not a huge amount of detail. But it is the Liberal Democrats who win the design prize – 19 references to design, including three explicit references to “design against crime” (thanks Nick, all our research on this issue clearly made an impact). They also win the prize for creativity for their section “Pride in Creativity” which has clear policies for education and more detail on support for the creative industries. Rodney Fitch once said that no other British Prime Minister had ever banged the drum of design quite as hard as Margaret Thatcher. And with the possible exception of Sir Robert Peel, he was probably right. So how do the Tories stack up in 2015? Design is actually mentioned, between “theatre” and “film”. 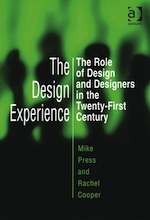 So, a very 1980s notion of what design is – which is curious given that the Cabinet Office actually has recently done some very fine work at embedding design in government. There is reference to support for creative industries, but mainly centred on tax breaks for the film industry and anti-piracy measures. The emphasis in education is on STEM rather than any reference to creative education. So the message is very much: we like the money the creative industries earn for us, we want people to have access to culture and arts, but how people are empowered to create that culture is not something we think is important enough to mention. But when we move on to the SNP, a rather curious and frankly disturbing black hole opens up. Just a simple word search results in: creativity: not found; design: not found; arts: not found; culture: mentioned twice in terms of business (culture of innovation) & twice in terms of agriculture and aquaculture; creative mentioned twice, both in the context of the BBC. There are a couple of very passing references to creative industries (less than two short paragraphs saying little), and one whole page about fishing. In Scotland the fishing industry employs 4,000 people and the creative industries employ 85,000. No mention of creative education at all. I am told that this is because all of these issues are devolved. Excuse me? Creativity and design are devolved? How does that work? Education is very definitely devolved but there is considerable reference to it in the SNP manifesto. There are five references to the devolved policy of “free” university education in Scotland. Five. Just in case you miss four of the references. Curiously there is no mention of the 1,000 further education jobs that have been cut and the 12% reduction in FE budgets resulting in a 48% reduction of part-time places, many of which are in creative disciplines. There is an interesting and telling use of language and reference to ideas in the SNP manifesto that is very conventional in its political rhetoric and simply does not refer at all to those ideas and methods that are transforming the public sector across Europe, which some other manifestos on the “progressive” side do. However, the SNPs wins the prize for repetition. In addition to the five references to “free” university education, the term “more progressive” was used eight times. Neither the Liberal Democrats nor the Labour Party mention “progressive” at all. The Greens refer to “progressive” seven times, but in terms of taxation and energy tariffs rather than the assertion of a political mantra. But don’t take my word for it, read these manifestos with an open mind and make your own decision. Whatever we think of political parties and their manifestos, they are the best guide we have to assess how seriously parties take the issues that are important to us. I’m voting for the party that helps us to design a better future. Oh yes, I nearly forgot. UKIP. Creative: not found; creativity: not found. So no surprises there. The references to design are twofold. ”Design and print by…” a reference to the printers of the manifesto. And “The EU Common Fisheries Policy (CFP) was designed from the beginning to steal our fish”. So long, Nigel, and thanks for all the fish.